Happy Thanksgiving! Hope you are having a fun day and spending time with your family today. I am enjoying having a day at home with my family. Our feast will be tomorrow with our extended family. Hopefully today will just be a relaxing day. Here are the birthday cards I have been working on that I promised I would share with you. 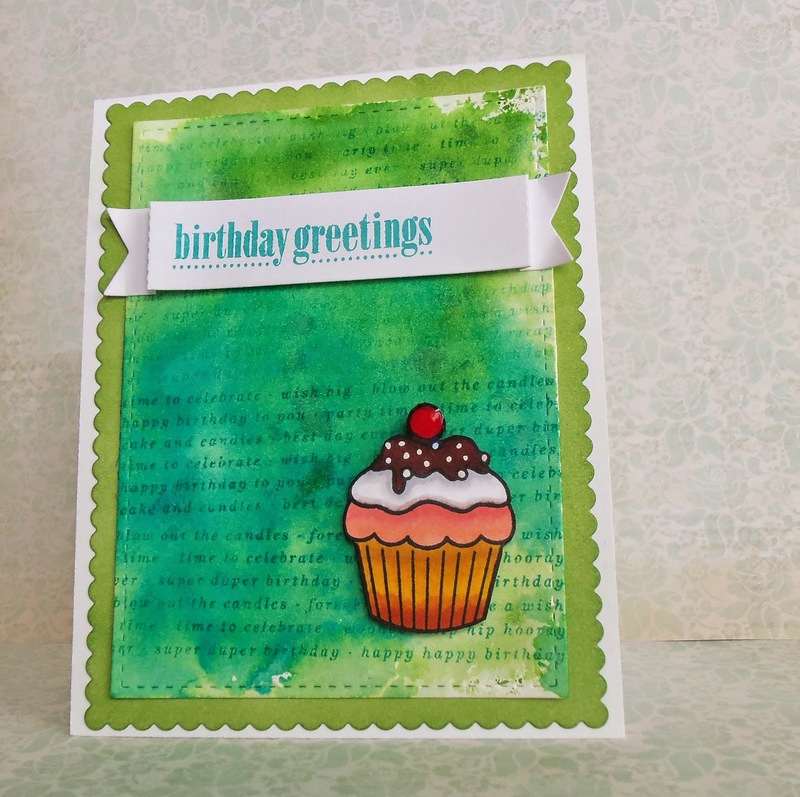 These two cards I used the Mama Elephant basic set of dies and their Carnival Cupcakes stamp set too. 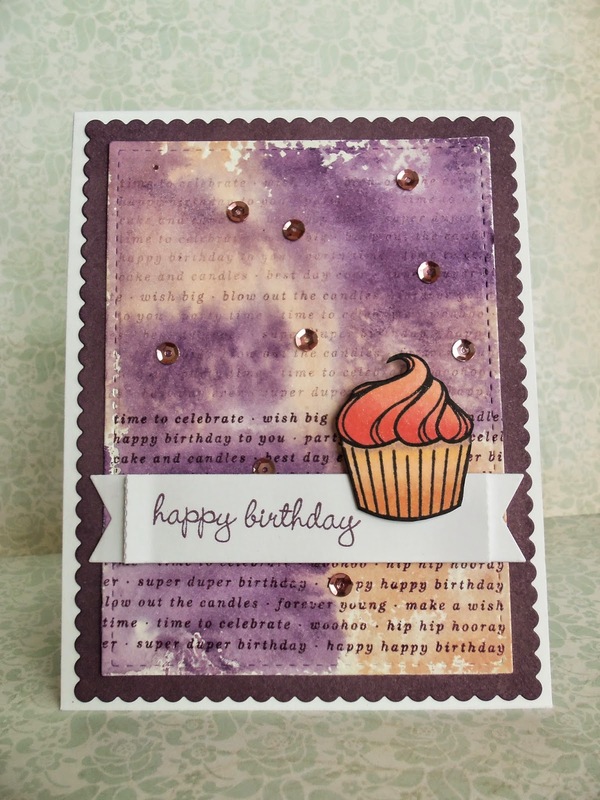 The birthday sentiments were from a Close to My Heart stamp set. The cupcakes were colored with Copic markers. The cherry has glossy accents and the pink cupcake has a wink of Stella. The water color panels are done with Tim Holtz distress inks and the Sentimental borders Mama Elephant stamp. The ink on the blue sentiment is Lagoon from Close to My Heart; and the purple is Purple Pansy. The sequins were from my miscellaneous stash of sequins. This time of year it is hard not to lose sight of Thanksgiving because all of us know that Christmas is coming and we are looking at our shopping list for Christmas because for most people the day after Thanksgiving signals the start of Christmas shopping. I think it is a shame that stores have started opening on Thursday night and an evening that use to be set aside for spending with family has turned into another night of shopping chaos. As a former retail employee it is the one weekend of the year you learn to hate. The long hours, the frantic and rude shoppers, no peace on earth or goodwill toward men is normally found in a store between Thanksgiving and Christmas. We have so much to be thankful for: Family, even if they aren't close by we are able to see and talk to them thanks to the Internet and smart phones. So, many things that there isn't enough space to write them all down. Even the little things like your kids saying, "I love you, Mommy or thank you Mommy." Just make sure you remember to thank God for all of his abundant blessings and his love. I made this card to give to my sister in law since she is hosting Thanksgiving this year at her house. I wanted her to know how thankful I was for her and that we are family. I used Mama Elephant dies from their Basic set, I also used their Sentimental borders stamp on my water colored panel. The chipmunk, letters, thanks stamp, and hearts are from Lawn Fawn. The Copper foil paper was made by taking silver poster board and coloring it copper with a Copic marker (E18). 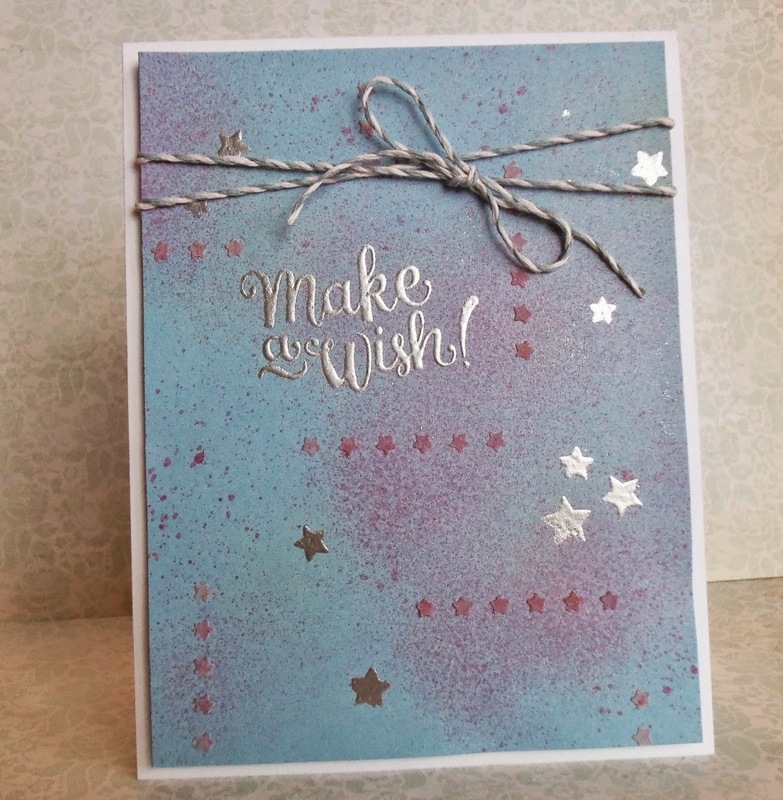 My next post will have some birthday cards with a similar look to them, make sure you check it out. 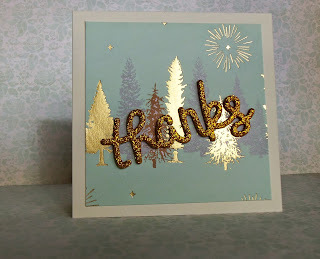 This card is going to be entered in the Mama Elephant November Challenge and also Simon Says Stamp Wednesday Challenge: Thanks/ Thanksgiving. 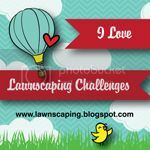 As well as the Work It Wednesday challenge. Thank you for taking the time to check out my blog today. Here are the card kits that I put together for this weekend. 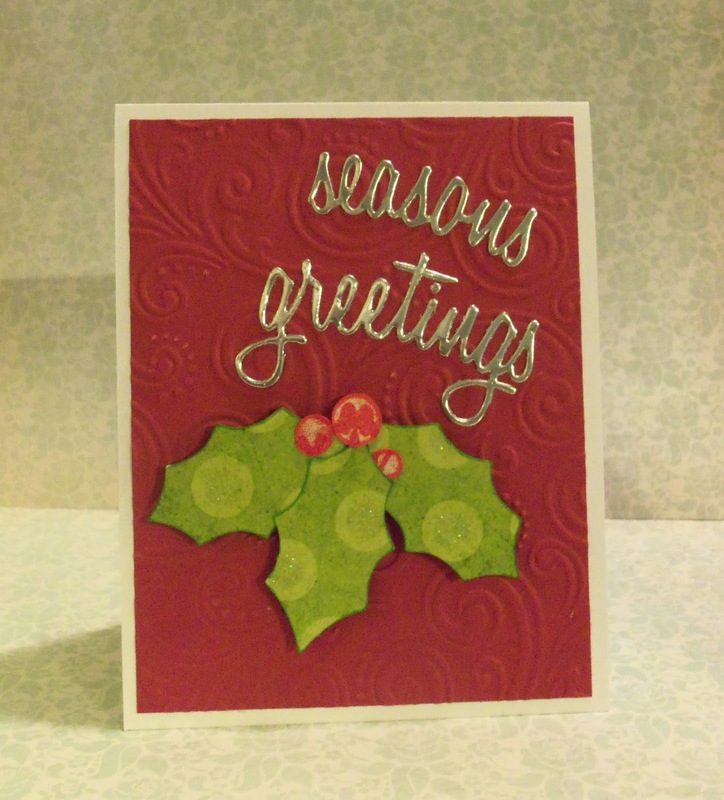 Quick and simple cards for the holidays. When you have a glamorous print for a background you really don't need much more for a simple card. I love the die cut from Mama Elephant makes these dainty little bows, they are so cute. 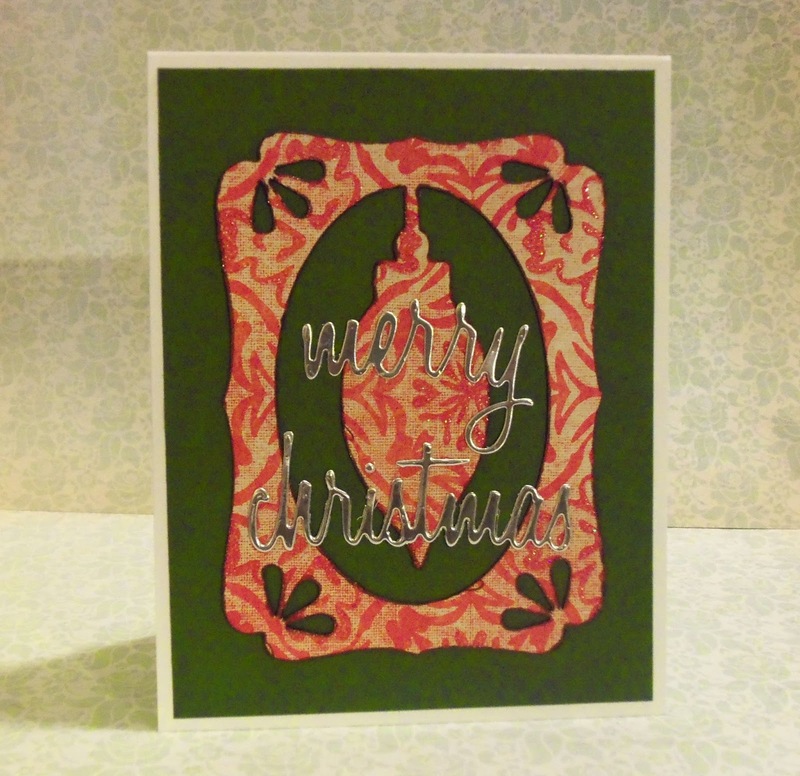 These two charming country style Christmas cards are dressed up a silver sentiment and an intricate die cut. 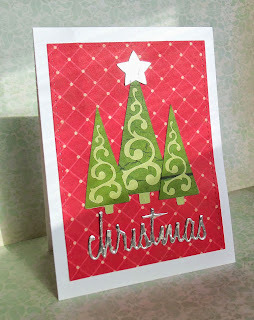 This card with the three trees and silver star I am going to enter in Simon Says Stamp Wednesday Challenge: Seeing Stars. 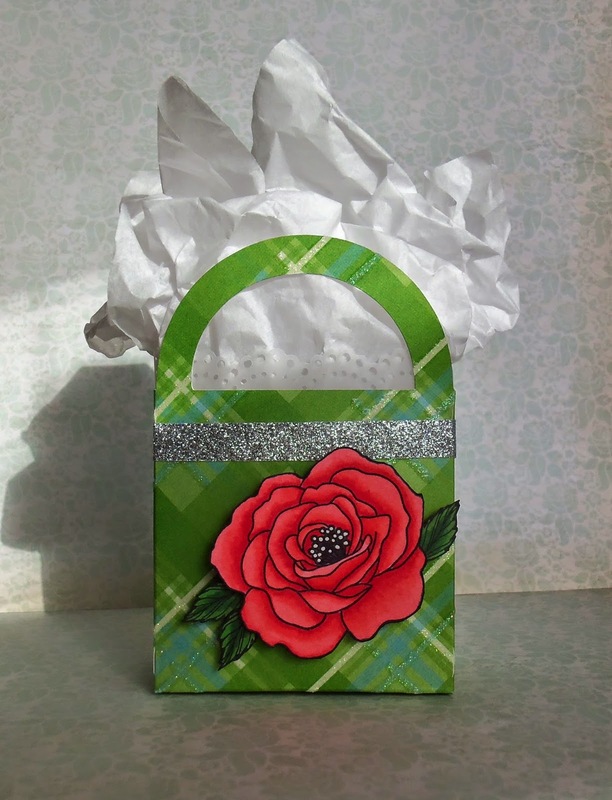 And last but not least the gift bag for my mother-in-law. I love this green glitter plaid, it made a great bag. I colored this rose with Copic markers and the centers with white gel pen. Hope you liked my work. I am off to have some fun and relaxation this weekend. Christmas cards are every where right now. So it is no wonder that my cards today are also Christmas. The first card I did was a clean and simple style of card. 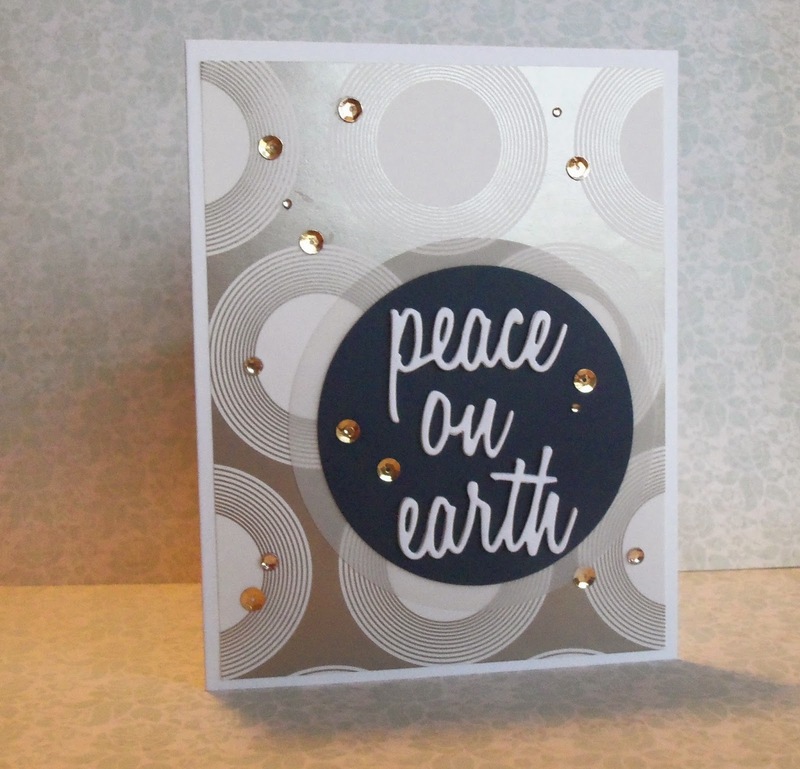 I went with a lot of circles and some metallic and it was a card I thought up when I should have been sleeping. 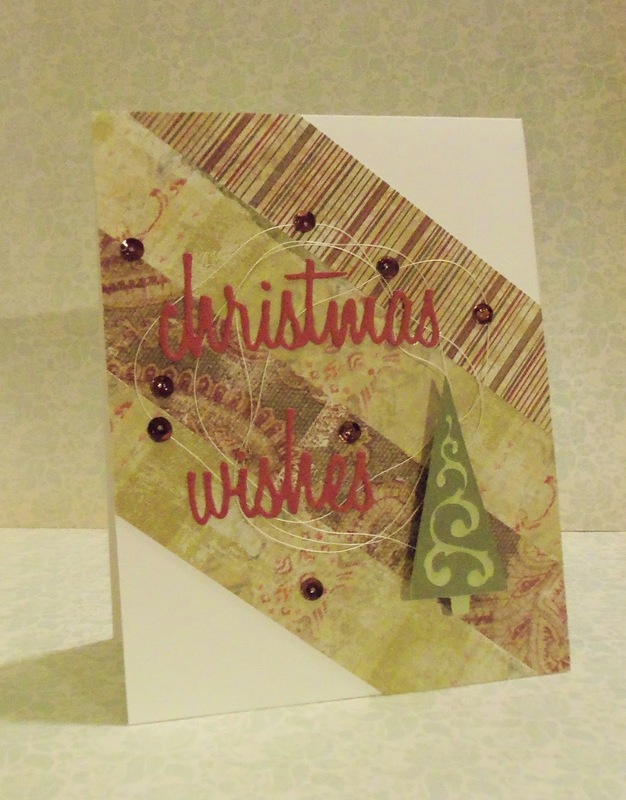 And the vellum circle really seem to make the card. It was an extra touch I thought of while cutting out the rest of the card. 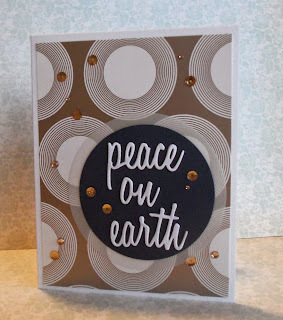 I am going to enter this card in Virgina's View Challenge #9 All things Metallic. I also made a couple of other cards too. 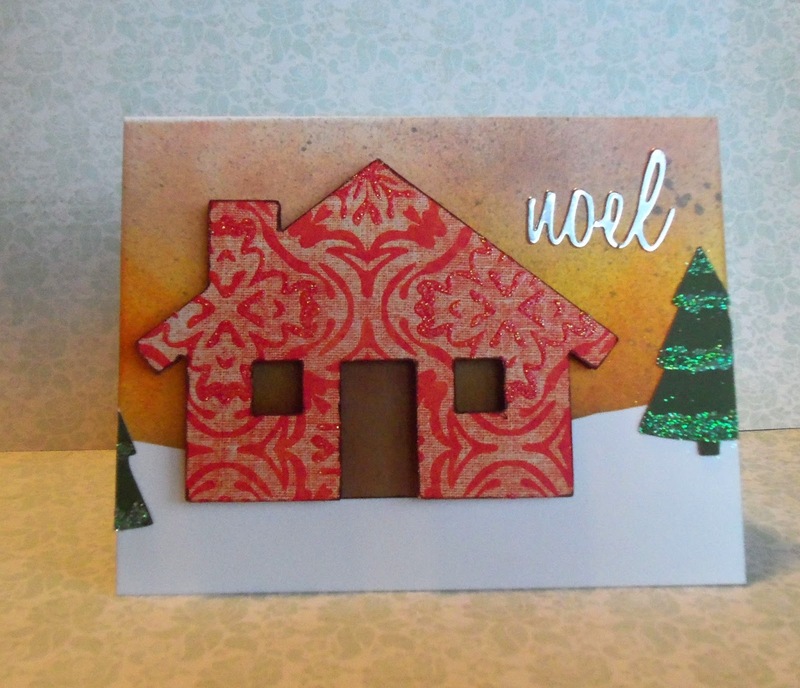 This card has a distress ink sunset behind the house. This lovely glitter printed paper was so pretty I just had to try this house with it. There is my silver poster board again, I used it instead of foil paper, looks almost the same and is much more cost effective. 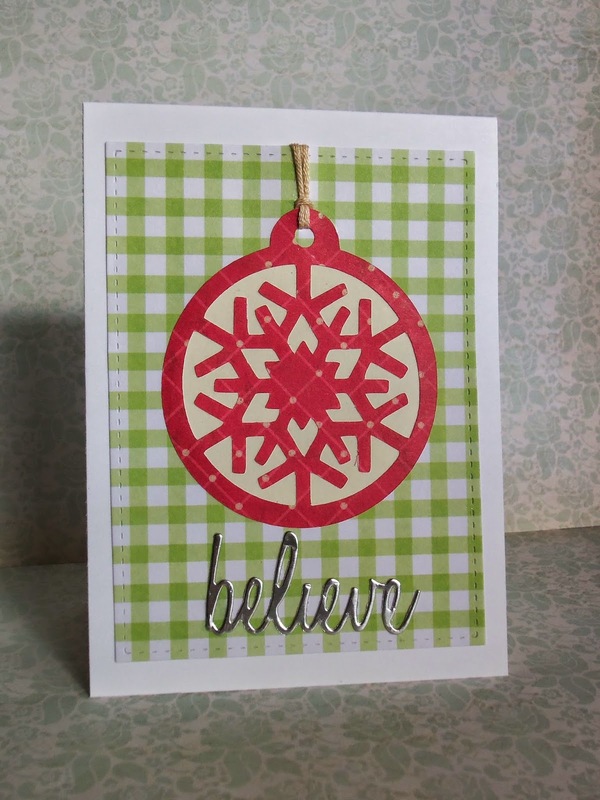 This shaker card was inspired by a card I saw on Simon Says Stamp blog. 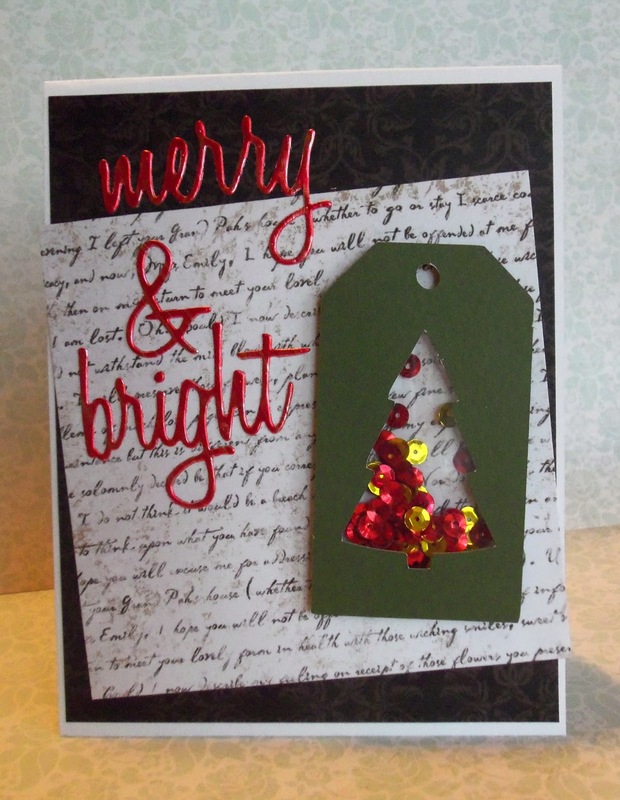 Someone made a card that had a shaker on it and it was a tree shape, I have been crazy to try that out and I had scrap of the clear plastic left that was the perfect size. I like saving my scraps because I can almost always find a use for them sooner or later. 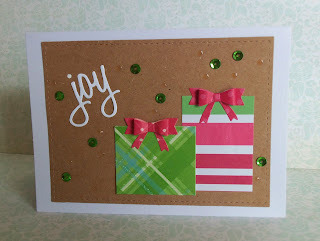 Another trick that I figured out on this card if how I can make my own colored foil paper in just about any color. I really wanted red when I thought up this card and I knew I didn't have any red foil paper and I remember when I took the Online Card Classes class on Copic Markers that they used the Copic markers to color string and gem stones. So, I decide to give coloring my poster board a whirl. Now I will tell you that it leaves lines on the poster board but since I was cutting out a sentiment that didn't really matter to me. In fact it look like texture if you even notice it on some thing that is this small. This weekend I have made up some card kits to share at ladies get away weekend in honor of my mother -in-laws 50th birthday. If I get a chance to share them here before I leave for the weekend. 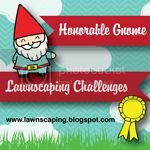 I really hope you have enjoyed viewing my projects and reading my blog. Please leave me some comments. If you read my last post you will see that I mentioned that I did not have hardly any Christmas things for my paper crafting collection. But I came across something delicious (you will have to watch Romona and Beezus to get the delicious) in my about once a month trek to my favorite store: Hobby Lobby. I bought a die cut set from Tim Holtz that has seventeen dies with Christmas sentiments in a scripty hand written look. It has been so great to have that die, and I have had fun using it. 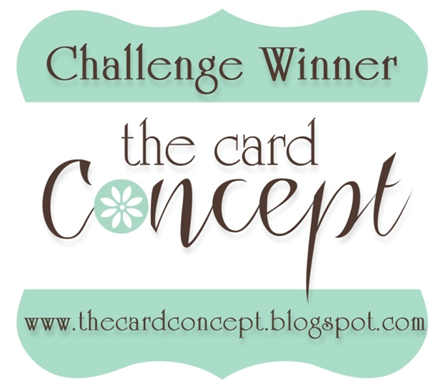 Today I have done three cards and I will be entering them in challenges. This card I just wanted to keep simple. My silver letters are actually metallic poster board. Being the frugal person that I am I decided to buy the metallic poster board as it was cheaper to begin with and was also bigger. The one thing that is difficult about this die fabulous set is that the dot on the "i" is so tiny and it's a little hard to keep track of. I recommend not popping it out of the die till you are ready to glue it on. This card is a little different for me. The string seems to be a trendy accent for cards and I decided to try it and it may have to grow on me a little more before I decide what I think of it. I had thought to put gold sequins on this card till I found these copper brown sequins in my stuff. They went better with the browns in my printed paper. My first card I am entering in Virginia's View Challenge: #9 All things Metallic. 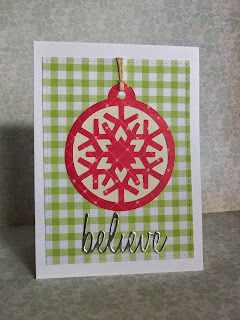 The second card I am entering in the Simon Says Stamp Wednesday Challenge: Anything Goes. 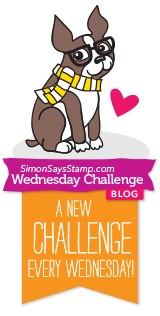 The third card I am going to enter in the Simon Says Stamp Monday Challenge: Good old days. I really hope that you like my work and would please leave to me some feed back.